Our summer camps feature a different theme each week with an array of opportunities that change daily. Students have a balance of free time to explore what they’re passionate about in addition to fun activities related to the camp theme. Little Star offers six weeks of summer camps for toddlers and early childhood students, Monday to Thursday 8:30 a.m. to 3:30 p.m. at our Winthrop campus. We often go on excursions to nearby river spots, the suspension bridge and walking trails. All camps are led by Little Star teachers as well as additional summer staff and/or Little Star alum students. Morning and afternoon snacks are provided. We also have several camps for older children, including an overnight archery camp. Additional camps for school-age children are provided by our partner organizations around the valley: Classroom In Bloom, Methow Valley Riding Unlimited and The Bush School. Registration opened March 11 and camps are filling fast! Please email geva@littlestarschool.org to inquire about availability. If you need financial assistance for summer camps, please fill out the financial aid application and turn it in with your registration form. Monday, Tuesday, Wednesday, Thursday, 8:30–3:30 p.m. Explore the world of smoke jumping! We will learn about fire, its behavior and how that behavior is influenced by the weather. We will design and test parachutes, practice basic jumping techniques and taste ‘fire camp food’. On your mark, get set, go! This camp will explore a variety of athletic activities that encourage balance and movement. We will have obstacle courses, relay races and ball games. Indoors we will learn about how our bodies move and what we need to do to stay healthy and active. Come explore the world of music with us through song, percussion and movement. Start a band, write a song and boogie down to good tunes! Together we will create homemade instruments and song books to be used long after our camp is over. Marmots, wolverines and bobcats, oh my! Join us to meet illustrious (and entertaining!) naturalists and thoroughly explore the outdoor world. Each day includes art, projects, stories, songs, scavenger hunts and fun facts about the Methow Valley. Enjoy four days of nature fueled creativity and exploration of the visual arts. We’ll use traditional and unusual items for painting, drawing and other methods of expression. Our hands-on creations will be inspired by the world around us! Become immersed in the enchanting and magical world of fairies, gnomes and their animal friends. We will share stories and songs, build fairy houses, make wings and pointy red hats, create art, share tasty treats and let our imaginations run wild. Want to learn a song about worms in Spanish and learn about how worms help our soil? Come plant seeds to take home, eat home-grown fruits and veggies and learn about horticulture in the Methow Valley. Splish splash we’re going to have a blast! Join us for some summer sprinkler fun and river fieldtrips. We will explore our theme of water through games, activities and art. Bring your swimsuit and a towel and be ready to get wet! Let’s jump into some African dance, bend and stretch into some yoga postures, tumble through some simple gymnastics and move our bodies to the beats of a variety of music! Grab your lab coat and get ready to hypothesize! We’ll spend the day making creative concoctions with natural ingredients and conducting experiments to learn about the world around us. Using found materials and manipulatives, we will follow the blueprints of our minds and collaborate to make our plans come to life. Lots of make believe will be involved! Our days will also include time for songs, stories, art and outdoor play. With Michelle Larsen, Vanessa Levine, Rebecca Haase, Kate Brien and additional summer toddler teachers! Join us this summer for six weeks of fun for little people! During our time together we will share stories, songs, Spanish, crafts, marvelous mess-making and more! After lunch we will embrace the brilliant, hot climate tradition of the “siesta” to give our little campers a second wind to get through the long summer days. Come discover the thrill of archery! We will teach you everything you need to know to safely enjoy this ancient sport. We will supply recurve bows and arrows. In addition to archery, we go on walking adventures to nearby river spots, explore nature and make our own field guides. The first two days of the camp will be held at Little Star, and the last day at Big Valley. Come discover the thrill of archery! Join us at the Big Valley Ranch for three days and two nights of archery, camping, river fun and outdoor adventure with experienced outdoor educators! Due to the popularity of this camp, we have added a 2nd session for 2019. Put on your creative hats! Let’s explore Classroom in Bloom’s expansive vegetable and native plant garden through the lens of art. We will learn about the wonders of nature and use its beauty to inspire fun and exciting art projects. Together we’ll beautify our school garden for many years to come! Nature games are the best! We will learn about food, animals and the natural world through movement and games. The Classroom in Bloom garden will provide energy and nourishment for everyone to keep playing. Bring your running shoes and camouflage clothes as we discover nature in a fun and exciting way. It’s time to get our hands dirty! Come explore the insects and animals that make Classroom in Bloom’s garden so special. We’ll dig in the dirt and turn over every leaf to find insects and critters that inhabit our world. We will also be visited daily by special farm animal guests so we can learn about our fuzzy friends. Hey! Who ate that tomato? What made that burrow? Let’s put our investigator caps on to search for clues about the mysteries of our Classroom in Bloom garden. We will use all of our senses to unravel the mysteries of the natural world. Special tools like hand lenses and microscopes will help our detectives solve the puzzles. Ages 5–7 years · June 18–20, 9 a.m.–1 p.m.
Ages 6–8 years · July 9–11, 9 a.m.–12:30 p.m. Learn basic safety and horsemanship including grooming, leading, vaulting, English and Western riding! Meet horses of all shapes and sizes and colors. High quality instruction with certified instructors and wonderful horses. Art in the Wild is a summer art camp for all kids ages 3–12 with community service volunteer opportunities for ages 13–18 presented by Confluence Gallery. 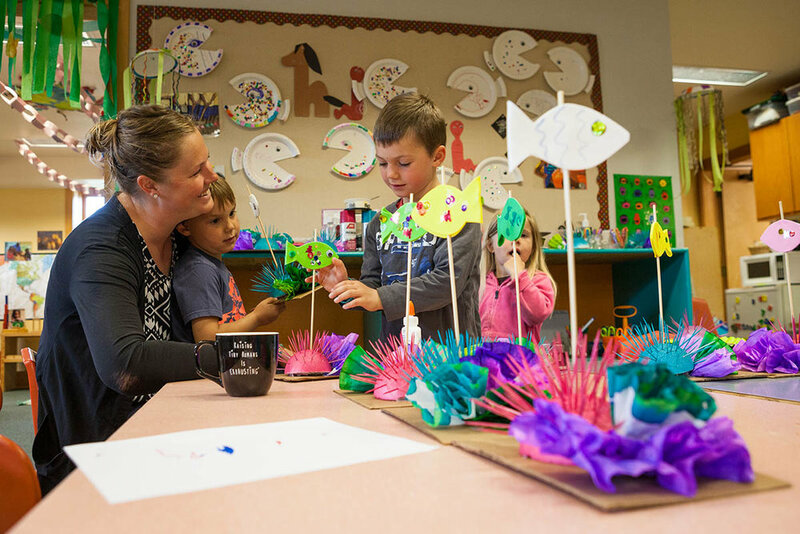 Each week explores the natural world through art making, providing an enriching art camp experience that is accessible for any child in the Methow Valley. Camouflage Camp · August 5–8, 9 a.m.–3 p.m. In this week of wild wilderness games, we’ll spend our days playing in the woods around The Bush School’s Methow Campus. While using our senses and developing our naturalist skills, we’ll learn lots of new group games and explore how animals survive in the forest. Learn tracking skills, native plant identification, and discover strange insects in the ponds as you become an expert naturalist. Don’t wear bright colors this week or you’ll be too easy to find! Animal Detectives Camp · August 12–15, 9 a.m.–3 p.m.
Join us for a week of exploring all the amazing animals that live in the forests of Mazama. We’ll follow wildlife tracks, hunt for animal homes, investigate the rivers and even build a National Park for ants! With scientific tools, games and stories we’ll unravel the clues of who lives here. Using our imaginations, we’ll even make some creative animals of our own. Get your detective hats ready, this mystery is sure to be an adventure! Assistant Counselor Training Camp · June 17–19, 9 a.m.–3 p.m.
Ready to hone your leadership skills and join the staff of one of the Methow’s great summer camps? Gear up at this three-day workshop. You’ll develop your own personal leadership style, practice First Aid and CPR, and learn techniques for managing kids of any age. Need a quick game to keep kids entertained? We’ll practice a variety so you have plenty of tricks up your sleeve. Whether you’re planning to babysit or earn service hours, this camp will help you feel confident and prepared to be a leader!